Palm oil was imported into Indonesia by the Dutch in 1848. Some seeds are planted in the Botanical Garden, while the remaining seeds were planted at the edges of the road as an ornamental plant in Deli, North Sumatra in the 1870s. At the same time meningkatlah vegetable oil demand due to the Industrial Revolution to the mid-19th century. Here then comes the idea of ​​making palm oil based on plant selection from Bogor and Deli, the type of oil dikenallah 'Deli Dura'. In 1911, plantations were cultivated and commercially cultivated in the Netherlands Indies pioneering Adrien Hallet, a Belgian, who then followed by K. Schadt. 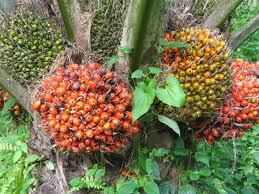 The first oil palm plantation is located on the East Coast of Sumatra (Deli) and Aceh. Plantation area reached 5123 ha. And captive breeding center was established in Marihat later (known as AVROS), North Sumatra and in Rantau Panjang, Kuala Selangor, Malaya in 1911-1912. In Malaya, the first plantation was opened in 1917 in the field Tenmaran, Kuala Selangor using the seeds from the Overseas Long Deli dura. In West Africa alone growing large-scale oil palm started in 1911. Until the Japanese occupation, the Dutch East Indies is the world's major supplier of palm oil. Ever since the Japanese occupation, production dropped to a mere fifth of the figure in 1940. Republican efforts to increase the time to do the program Pregnant women (labor-military) are not successful in increasing yields, and then taken over a major supplier of Malaya (and Malaysia). New since the New Order era encouraged the expansion of planting area, combined with PIR plantation system. The expansion of oil palm plantation area continues due to rising oil prices so that the role of increased vegetable oil as alternative energy. Several palm trees are planted in the Bogor Botanical Gardens until now is still alive, with a height of about 12m, and is the oldest palm in Southeast Asia from Africa.